Computer-based testing for the new Portable Power Distribution Technician examination is now available. ETCP needs as many candidates as possible to test by August 23, 2016 to obtain cut-score information on the new examination. 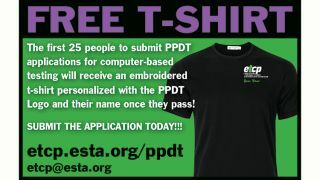 The first 25 candidates to apply will receive a free t-shirt with the new PPDT logo and their name if they receive a passing score. Because this is a new examination, score reports will be delayed during this time. The ETCP PPDT certification is focused on the large population of industry workers in the roles of technicians, stagehands, portable power set/strike technicians, as well as facility maintenance personnel for a wide variety of venues. This certification targets the top two-thirds of people working with this technology at various types of facilities in the corporate, trade show, outdoor event, theatrical, and motion picture/television segments of the entertainment industry. This certification is a subset of the Entertainment Electrician content outline and does not include questions relating to luminaires, networking, or control systems. ETCP uses a point system to determine eligibility to sit for examinations. A candidate must have 25 points to apply for the ETCP Portable Power Distribution Technician examination. Points can be earned through work experience alone or through a combination of training (i.e., internships or apprenticeships), licensure, and degrees from accredited institutions. Courses taken outside a formal program of undergraduate or graduate studies do not count toward eligibility.